Melanoma is the most serious form of skin cancer. Even so, if diagnosed and removed while it is still thin and limited to the outermost skin layer, it is almost 100% curable. Once the cancer advances and metastasizes (spreads) to other parts of the body, it is hard to treat and can be deadly. During the past 10 years, the number of cases of melanoma has increased more rapidly than that of any other cancer. Over 51,000 new cases are reported to the American Cancer Society each year, and it is probable that a great many more occur and are not reported. The answer to the question asked by patients, their families, and other concerned people is that melanoma is the most serious form of skin cancer. To reach a more complete understanding, it is necessary to learn how the cells in the body become malignant. Melanoma is a malignant tumor that originates in melanocytes, the cells which produce the pigment melanin that colors our skin, hair, and eyes and is heavily concentrated in most moles. The majority of melanomas, therefore, are black or brown. However, melanomas occasionally stop producing pigment. When that happens, the melanomas may no longer be dark, but are skin-colored, pink, red, or purple. The physician will tell you whether the melanoma is early or advanced by describing it as either in situ or invasive. “In situ” is Latin and means “in one site” or “localized.” Melanomas in situ occupy only the uppermost part of the epidermis, the top layers of the skin. Invasive melanomas are the more serious, as they have penetrated more deeply into the skin and may have traveled from the original tumor through the body. 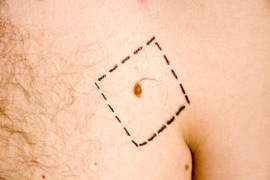 Superficial spreading melanoma is by far the most common type, accounting for about 70 percent of all cases. As you might expect, this melanoma travels along the top layer of the skin for a fairly long time before penetrating more deeply.The first sign is the appearance of a flat or slightly raised discolored patch that has irregular borders and is somewhat geometrical in form. The color varies, and you may see areas of tan, brown, black, red, blue, or white. Sometimes an older mole will change in these ways, or a new one will arise. The melanoma can be seen almost anywhere on the body, but is most likely to occur on the trunk in men, the legs in women, and the upper back in both. Most melanomas found in the young are of the superficial spreading type. Lentigo maligna is similar to the superficial spreading type, as it also remains close to the skin surface for quite a while, and usually appears as a flat or mildly elevated mottled tan, brown, or dark brown discoloration.This type of in situ melanoma is found most often in the elderly, arising on chronically sun-exposed, damaged skin on the face, ears, arms, and upper trunk. Lentigo maligna is the most common form of melanoma in Hawaii.Lentigo maligna melanoma is the invasive form. The third type of melanoma, acral lentiginous melanoma, also spreads superficially before penetrating more deeply. It is quite different from the others, though, as it usually appears as a black or brown discoloration under the nails or on the soles of the feet or palms of the hands. This type of melanoma is sometimes found in dark-skinned people. It is the most common melanoma in African-Americans and Asians, and the least common among Caucasians. Unlike the other three types, nodular melanoma, is usually invasive at the time it is first diagnosed. The malignancy is recognized when it becomes a bump. The color is most often black, but occasionally is blue, gray, white, brown, tan, red, or skin tone.The most frequent locations are the trunk, legs, and arms, mainly of elderly people, as well as the scalp in men. This is the most aggressive of the melanomas, and is found in 10 to 15 percent of cases. What treatment is available for Melanoma? The best treatment is early detection. A quick look from the trained eye of a dermatologist can confirm whether or not a lesion is suspicious for melanoma. If so, the next step is to perform a biopsy. The area is made numb, and a portion, or the entire lesion is removed for examination under the microscope. This simple, quick procedure is performed in the dermatologist’s office. If a melanoma is detected, treatment is guided by how deep in the skin the melanoma is.